Bills QB EJ Manuel, below, had to tackle Kyle Arrington after he came up with the ball in the first half. ORCHARD PARK, N.Y. — The Patriots beat the Bills in Sunday’s season opener on a last-second field goal by Stephen Gostkowski, which was set up by a clutch offensive drive that required two third-down conversions. But the Patriots might not have been in position to even pull out the 23-21 win if not for the defensive work of cornerback Kyle Arrington. He forced two fumbles, both of which were recovered by the Patriots deep in Buffalo territory. Both were converted into touchdowns. The first fumble came on Buffalo’s second play of the game. C.J. Spiller took a handoff and came left toward the sideline, but Arrington popped the ball loose and defensive tackle Tommy Kelly recovered at the 16. Three plays later, the Patriots took a 7-0 lead on a 9-yard touchdown pass from Tom Brady to Julian Edelman. Arrington’s second forced fumble was late in the second quarter, with the Patriots holding a 10-7 lead. He stripped Marquise Goodwin of the ball at the 38 after a short reception, and defensive end Rob Ninkovich was there to pounce on it. No surprise: Ninkovich has now recovered 10 fumbles since the start of the 2010 season, the most in the NFL. The Patriots turned the second turnover into a second touchdown, with Brady again hitting Edelman, this time from 8 yards. For all the pregame chirping wide receiver Stevie Johnson did about the Patriots not having anyone in the secondary who could cover him, one of the biggest plays of the game was his dropped pass on third and 1 from the Buffalo 49 with nine minutes left and the Bills leading, 21-20. The play, had Johnson caught the ball, would have been good for a first down. Patriots cornerback Aqib Talib took the high road, focusing instead on the stops made by the defense and the two forced turnovers. “We just played what was called, read our keys, tried to tackle well,” Talib said. Johnson did get behind the defense for an 18-yard touchdown catch from E.J. Manuel on the first drive of the second half, putting Buffalo ahead, 21-17. Those would be the last points the Bills scored. Johnson finished with three receptions for 39 yards. Lost in the tougher-than-expected victory was Edelman becoming the punt returner with the highest average in NFL history. Edelman needed three punt returns to reach 75 for his career and become eligible for the all-time league record. That’s exactly how many he returned, for 32 yards. More importantly, he also caught seven passes for 79 yards and scored two touchdowns. Edelman now has 75 career punt returns for 975 yards, a 13.0-yard average. The NFL leader had been George McAfee, who averaged 12.8 yards on the 112 returns he made for the Bears (1940-41, 1945-50). All Edelman has to do now to hold onto the record is keep his punt return average high enough. With six players from the 53-man roster already ruled out before the Patriots even arrived in Buffalo, that left just one more name to be added to the inactive list. It ended up being running back/kick returner Leon Washington, who re-signed with the team Saturday. Washington was spotted on the field well before Sunday’s game, being put through conditioning drills by a member of the Patriots’ staff. His absence left just three running backs on the 46-man game roster: Stevan Ridley, Shane Vereen, and LeGarrette Blount. Washington joined tight end Rob Gronkowski (forearm/back), receiver Aaron Dobson (hamstring), running back Brandon Bolden (knee), defensive backs Nate Ebner (ankle) and Duron Harmon (hamstring), and offensive lineman Will Svitek. Those six players missed some or all of practice last week. Ryan Allen had an up-and-down debut, with a pair of poor punts: a 19-yarder in the second quarter, and a 35-yarder late in the third, when the Patriots were pinned deep in their own territory and could have used a much better effort. But he did have a 65-yarder that, thanks to a curious decision by Leodis McKelvin to not field it, landed and bounced an additional 20 yards. Allen also had three of his six punts (39.3-yard average) downed inside the 20, and none of his kicks were returned by the Bills. Allen also did a flawless job holding for Steven Gostkowski’s three field goals, including the winner with five seconds left. Was he nervous on the final kick, with the game at stake? The Patriots will have just five captains this season: Brady, Logan Mankins, Jerod Mayo, Matthew Slater, and Vince Wilfork. After serving as a captain for each of the last two years, Devin McCourty was not re-elected to the position. This is the 12th straight season that Brady has been chosen a captain. It is the sixth for Wilfork, fifth consecutive for Mayo, and third straight for Mankins and Slater . . . With the fumble recovery by Kelly on the season’s first defensive series, the Patriots extended their consecutive games streak of forcing at least one turnover to 28. They’ve got a ways to go to catch the Philadelphia Eagles, who hold the NFL record. The Eagles had at least one takeaway in 71 straight games, from 1985-90 . . . Before losing a third-quarter fumble on a fourth-and-goal play at the Bills 1, Brady successfully had converted 56 straight quarterback sneaks when it was either third or fourth down and 1 yard to go . . . Looking for another bright spot? Gostkowski had five of his six kickoffs not returned, the Bills taking a touchback. The only kickoff that was brought out was an ill-advised decision by T.J. Graham, who fielded the ball 7 yards deep in the end zone and returned it to the 12-yard-line . . . The Patriots appeared to come out of the game fairly healthy, a good sign considering the short turnaround before Thursday’s home opener against the Jets. Linebacker Brandon Spikes left the game in the first quarter with what the team labeled a dehydration issue, but he returned in the second half. Danny Amendola left with a right groin injury but also returned . . . Wondering who might return kickoffs for the Patriots? 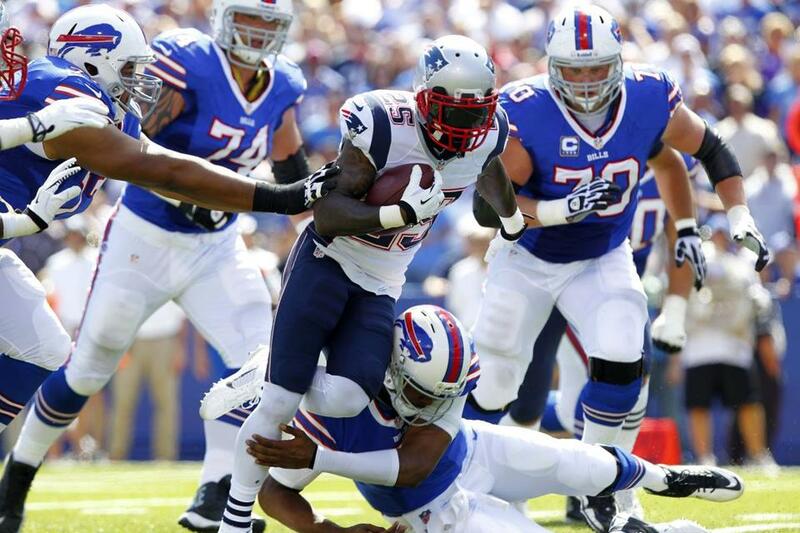 That job was given to Blount, who averaged just 17.5 yards on his two returns . . . The victory was the 226th for the Patriots since Robert Kraft purchased the team. The Patriots’ previous owners combined for 225 wins. Kraft’s teams have a record of 226-110 since he bought the team in 1994; in the 34 years prior, the Patriots were 225-276-9. Shalise Manza Young of the Globe staff contributed to this report. Michael Whitmer can be reached at mwhitmer@globe.com.